FlossieBlossoms: Potholder Pass II sucessfully completed! 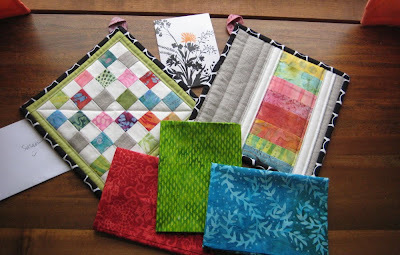 I participated in a potholder swap and was lucky enough to receive these from spottedstonestudio, much to my delight. 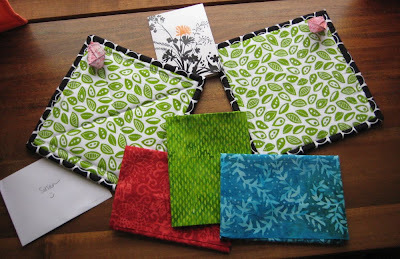 Krista also sent me 3 lovely batik fat quarters to go along with them and a really sweet note. This is one seriously talented lady and I so appreciate the time and trouble she went to to make these for me. She has 3 kids and one is just a sweet little baby, I don't know how she gets anything done, but she does and she does it so well. And to add to the coolness factor, she lives way up north in Alaska! Here's whatI sent my partner-hopefully she'll like it. 2 wonky potholders, some Pez fabric and a condiment wallet. I also jazzed up a note card to match. I had fun making them, this was my first wonky star and I think it turned out great. I learned how to make this star from my friend Pamela, who has a great shop on Etsy. She's another super talented lady and is very generous with her knowledge, which I so appreciate. We had company come for the weekend so I've been busy cleaning house and then having fun with Jennifer and Charles. The boys fished every day, all day, leaving us to our own devices, which was wonderful. We cooked, ate, drank, watched movies, visited, laughed, ripped paper off my string blocks, sat in the sun, and just generally had a great time. Oh, we sneaked in a visit to my mother, the Mumster, too. That was good, she just loves Jennifer (it's mutual) and she considers her a daughter, because Jen "gets" her. Mum is 89 but doesn't look it or act it. No photos of us, though, because we were too busy chillin'. :) It was a great weekend and we capped it off with little grown-up Easter baskets (cute Rubbermaid containers) at breakfast (I can't believe we didn't photograph them, the table looked fun) with chocolates, toys, notepad, fishing lures, gummy worms, Swedish fish, etc. They were a hit! I hated to see them leave, but Charles and Jennifer both have to be at work tomorrow, darn it. They're the best, easiest company, too. SO helpful and fun. We just LOVE them. Travel safe, you two! I love the potholders you made. They are gorgeous. You also received some wonderful potholders. What great swap gifts!!! Love them!!! 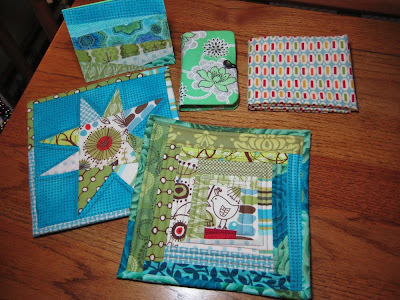 I love the potholders you received in the swap. Your swap partner did a great job. 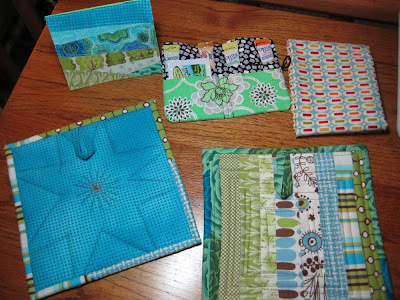 The potholders you made for your swap partner are equally as nice. Great job! The potholders you made are adorable, and the ones you recieved are wonderful too!! It sounds like you had a great weekend with great friends!! The 'other' Krista and I have been in touch, which is a hoot. Gotta love swaps!